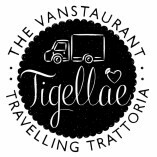 Based in Manchester, Tigellae offer bespoke mobile catering with a difference. With the help of our Vanstaurant (our Italian kitchen on the road) we want to bring you every aspect of the Italian dining experience, from beautiful artisan pasta to the lightest, fluffiest tiramisu you can imagine. Changing menus of interesting dishes and excellent quality of ingredients cooked to restaurant standards. Friendly service and excellent food knowledge from staff.